Waters of the United States: EPA’s proposed update to the Clean Water Act. The feds want to define “waters of the United States” scientifically. Farmers are freaked out. 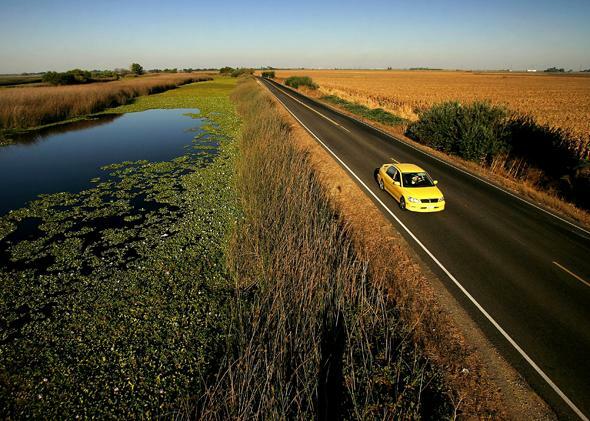 Water is held back from a lower-elevation farm by a section of Highway 4, pictured in 2005, that serves as a levee road in the Sacramento–San Joaquin River Delta, west of Stockton, California. Government agencies set down rules for how to interpret laws they are tasked with enforcing. In April, the EPA proposed changes to how it will define “waters of the United States” in its rules. Howls of protest have followed, particularly from farmers and ranchers. Congress ordered hearings on the subject this summer. Though the rule updates have yet to be finalized—public comment is open until October—this week the House passed H.R. 5078, a bill to prevent the EPA from implementing the proposed rules. Its title—“Waters of the United States Regulatory Overreach Protection Act”—captures the attitude behind the bill. In theory, the proposed update makes standards clearer by using consistent, scientific terms from hydrogeology to define which waters the Clean Water Act covers. In practice, its critics charge, the update is 80 pages of technical and legal jargon that is “beyond the knowledge of any farmer I know,” says Will Rodger, a spokesman for the American Farm Bureau Federation, the country’s largest farm lobby. “A good portion of the water on my rice farm would count as wetland ‘water of the U.S.,’ ” Bob Stallman, head of the Farm Bureau, told me. “Will I now need a permit every time I want to water my rice?” The rule exempts ditches that drain into uplands, but this has not mollified farmers. “No one builds the kind of mythical ditch they say is excluded under these rules,” Stallman claims. The EPA says this is nonsense—and some of its administrators have expressed exasperation with what they see as willful misinterpretation that has undermined efforts to craft sound policy. “The intent is not to make farmers’ lives harder,” an EPA official told me. Representatives from the agency have been traveling the country to explain their intentions and answer questions. They stress that input from citizens on how to make the language clearer is welcome: Everyone should know just what the rules mean and what they don’t mean. But writing a rule to everyone’s satisfaction is a tall order. Clear regulations have always been hard to pen, and they have gotten harder. Decades ago, regulatory lawsuits were rare because they could be brought only after an agency charged someone with violating the rules. This changed in 1967, when Abbott Laboratories argued that compliance costs meant those being regulated should have a say in objecting to them. In Abbott Laboratories v. Gardner, the Supreme Court agreed: Now regulators can be sued even before proposed rules are enforced. The flow of pre-emptive lawsuits keeps increasing: Notices of intents to sue the EPA for how it enforces the CWA have risen 30 percent since 2003. “Regulators undoubtedly have to be more careful now to write things with court preferences in mind,” says Fred Emery, a former director of the Federal Registry who now teaches regulatory writing. Rules are written not just to uphold the will of Congress but also to avoid the wrath of courts. The rumbling over the EPA’s “waters of the United States” rule is less about its imperfection, though, and more an illustration of deep-seated mistrust of the government. Redefining waters with hydrological terms is unlikely to actually change any farming practices, says Fouad Jaber, an agricultural engineer at Texas A&M University. And in an attempt to clarify the scope of its proposal, the EPA has issued an “Interpretive Rule” to explain its position and purpose, explicitly stating that it intends to leave famers’ current practices alone. Farmers don’t buy it. “I don’t trust a word out of their mouths,” a Texas farmer told me. Changes to rules may be intended as broad protective measures, but farmers see them as slapping punitive incentives onto the process. And farmers are already good stewards of their lands and waters, argues Carl Lindgren of Cleremont Farm in Virginia. In Loudon County, where hardy Black Angus cows and prize-winning racehorses graze on verdant fields, it’s common practice to line farm ditches with straw to absorb pollutants. Many farmers voluntarily work with federal agencies to develop conservation plans. “New” EPA rules make ordinary famers feel mistrusted, and then they bristle. Yet collectively, agricultural runoff contributes 12 million tons of pollution a year to public waters, according to 2004 estimates (the most recent year for which national data is available) from the U.S. Geological Survey. Phosphate and nitrate pollution from fertilizers washes into lakes and seas, causing algae blooms that leave toxins and dead zones behind. This summer in Ohio, algae blooms in Lake Erie spurred by fertilizer runoff caused water shut-offs affecting 400,000 people. The Clean Water Act rules need to be updated. But beyond that, the EPA should interpret its authority more broadly. Hammering out agreeable standards is proving as difficult as making water run uphill. Suspicion played up for political purposes does not help. Whatever is finally decided about what waters make up the “waters of the United States,” a gusher of lawsuits looms.